Located in Tamil Nadu, we are engaged in the production and distribution of Narrow Aisle Forklift Truck. The Narrow Aisle Forklift Truck has advanced AC control system with MOSFET that delivers smooth driving speed control for precise working. 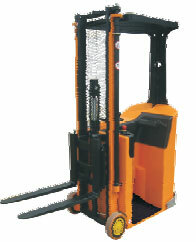 We offer the Narrow Aisle Forklift Truck at the market leading price.